The galah (Eolophus roseicapillus) is one of the smaller species of cockatoo and it has amazing colors. It’s chest is bright pink, the wings are light grey and the crest is whitish pink. The bill and feet are bone-colored. This bird is very common in the wild in Australia. Australians call these cockatoos pink & grey galahs. The Galah occurs naturally in the whole continent of Australia. They are very abundant and can be seen in big groups in open fields. They have grown more abundant by human influences, because they eat crops and make use of the cattle drinking ponds/wells. This species occurs mostly in the open field and sleep in trees in this field. They do not live in forests. 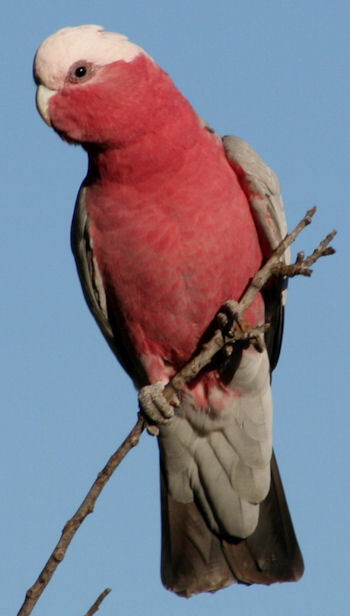 The Galah is most related to the white cockatoo species and corellas, but from all of them it is the most distantly related. There are no other closely related species to the Galah. Check out the page about all the species to see the relatedness. A Galah is a nice bird to keep as a pet, if you give it the proper care and housing. They are not very big, making it easier to give them a nice aviary or big cage. Like all species of cockatoo these birds are capable of screaming very loudly, but in practice they do not do this as often as other species of cockatoo. 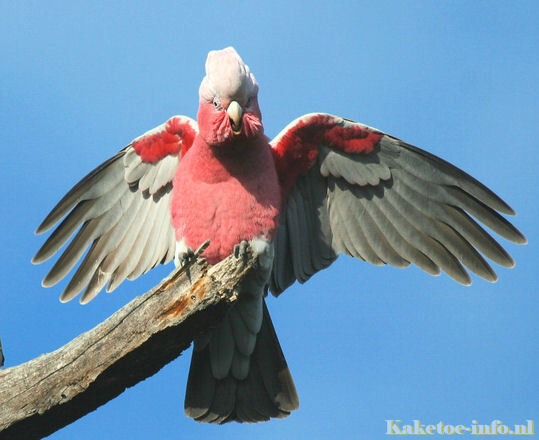 Most Galah’s are not very cuddly birds (unlike e.g. Umbrella Cockatoos) but of course there are individual differences. A Galah cockatoo is very playful and a little hyperactive. The really thrive well with another cockatoo as a companion.